Pick an industry, from automobiles to artificial intelligence, and odds are you’ll find examples of blockchains in action. In all quarters and all circles, blockchains are making their mark. Even the US Treasury is in on the act, advocating for more pilot projects and test programs. The ‘World Economic Forum’ anticipates that 10% of global GDP will be stored on the blockchain by 2025. That means the global executives out there are preparing for this seismic shift, and are ready to completely back its implementation. The impact of distributed ledger technology could be as grand as the internet revolution itself. The use cases differ, but the benefits derived from using the technology remain unchanged: transparency, immutability, redundancy and security. In 2018, new blockchain initiatives are launched every day. Here are 50 examples of blockchains in use around the globe. A number of governments have expressed an interest in blockchain technology to store public records on a decentralized data management framework. Essentia is developing an e-government pilot with Finland’s Central Union of Agricultural Producers and Forest Owners. Blockchain will enable urban and rural citizens throughout Finland to access records.Other use cases include government applications such as education, public records and voting. Waltonchain’s RFID technology is being used by a Smart Waste Management System in China. Using Walton’s blockchain, the project will enable supervision of waste levels to improve operational efficiencies and optimize resources. Zug in Switzerland, known as “Crypto Valley” has developed a blockchain project in partnership with Uport to register residents’ IDs, enabling them to participate in online voting and prove their residency. Essentia has been meeting with the Dutch government to create a new systemfor vetting passengers traveling between Amsterdam and London. At present, passengers on the Eurostar train between the two countries undergo border control checks at multiple points. Essentia is studying a blockchain-based solution that would securely store passenger data, enabling the metrics recorded in the Netherlands to be audited by agencies in the UK. Blockchain would provide a means of ensuring that the data has not been tampered with and is verifiably accurate. Medical records are notoriously scattered and erroneous, with inconsistent data handling processes meaning hospitals and clinics are often forced to work with incorrect or incomplete patient records. Healthcare projects such as MedRec are using the blockchain as a means of facilitating data sharing while providing authentication and maintaining confidentiality. Clients of Microsoft Azure Enterprise can access the Ethereum Blockchain as a Service. This provides businesses with access to smart contracts and blockchain applications in a secure hosted environment. Google is also reported to be working on a proprietary blockchain to support its cloud-based business. Parent company Alphabet is developing a distributed ledger that third parties will be able to use to store data, believed to be in regards to Google’s cloud services for enterprises, with a white label version for companies also in the works. Medical centers that have digitized their patient records don’t distribute their data across multiple facilities, instead keeping them on-site on centralized servers. These are a prime target for hackers, as evidenced by the ransomware attacks that struck NHS hospitals in the UK. Even if security risks are overlooked, there is still the problem of fragmentation. There are currently more than 50 different electronic healthcare record (eHR) software systems that operate in different hospitals, often with dozens of different packages within the same city. These centralized systems do not interoperate with one other and patient data ends up scattered between disparate centers. In life-and-death settings, the lack of reliable data and sluggish interfaces may prove devastating. The Essentia framework addresses all these issues by using a blockchain-powered system that will store clinically relevant patient data and which can be immediately accessed, regardless of geographical borders. Patient privacy is maintained on a secure decentralized network where access is granted to only those who are medically authorized and only for the duration needed. One of the main benefits of blockchain technology is the way it removes intermediaries or middlemen. The music business is a prime example of an industry whose inefficiencies have seen artists poorly remunerated for their efforts. A number of blockchain-based projects have sprung up seeking a fairer deal for music creators, including Artbit, overseen by former Guns N Roses drummer Matt Sorum. As a heavily industrialised nation, China’s environmental footprint is substantial. In March 2017, IBM launched the Hyperledger Fabric blockchain in conjunction with Energy-Blockchain Labs, as a means of tracking carbon assets in China. This creates a measurable and auditable system for tracking emissions, and facilitates a tradable market for companies seeking to offset their energy consumption whilst incentivizing greener industrial practises. China is proving to be a ripe test bed for blockchain projects, for it’s also home to the world’s first agricultural commodity blockchain. Louis Dreyfus Co, a major food trader, has set up a project with Dutch and French banks which are used for selling soybeans to China, with transactions settled quicker than traditional methods thanks to the use of blockchain technology. The De Beers Group, the world’s most famous diamond company, now has its own blockchain up and running, designed to establish a “digital record for every diamond registered on the platform”. Given concerns about the source of diamonds, and the ethics concerning their country of origin, coupled with the risk of stones swapped for less value ones along the line, blockchain is a natural fit. Because each record is indelible, it will ensure that data for each stone lasts as long as the diamonds themselves. Ukraine holds the honor of becoming the first nation to use blockchain to facilitate a property deal. A property in Kiev was sold by prominent cryptocurrency advocate and TechCrunch founder Michael Arrington. The deal was enabled with the aid of smart contracts on the Ethereum blockchain, and is intended to be the first of many completed by Propy, a startup specializing in blockchain-based real estate deals. Blockchain is now being used to support sustainable fishing. Illegally caught fish is an endemic problem within the industry, and distributed ledger technology provides a means of proving where fish were caught, processed and sold. This ‘net-to-plate’ chain allows inspectors to determine whether fish had come from regions notorious for human rights abuses or from countries that are affected by economic sanctions. Similar to the diamond trade, the art industry is dependant on the provenance and authenticity of artworks. While blockchain cannot authenticate a painting to determine whether it is an original or forgery, it can be used to prove the piece’s previous owners. In addition, blockchain is now used as a means of acquiring art. It’s another example of how blockchain technology can be used to make tangible objects easily tradable and exchangeable from anywhere in the world, without the need to physically transfer them from secure storage. In the Australian city of Fremantle, an ambitious project focused on distributed energy and water systems is using blockchain technology. Solar panels are being used in the sun-blessed region to capture electricity, which is then used to heat water and provide power, and the data recorded on the blockchain. Chile’s National Energy Commission has begun using blockchain technology as a means of certifying data pertaining to the country’s energy usage. Sensitive data will be stored on a blockchain as part of an initiative to help modernize and secure the South American nation’s electrical infrastructure. Blockchain can be helpful in building the “pink economy”, as well as helping the LGBT community to fight for their rights without revealing people’s identities. The latter is an extremely important issue since hate crimes are a recurring problem within the gay community, especially in countries notorious for human rights abuses and where homosexuality is outlawed or at least frowned upon. Cat bonds can be the only hope for people who have been victims of earthquakes, tsunamis and other natural disasters. Blockchain allows for quick and transparent settlements between parties, and creates certainty that the system will remain operational even without human operation. Blockchain has now successfully been used as a cat bond settlement mechanism. In 2016, the US Department of Homeland Security (DHS) announced a project that would use blockchain as a means of securely storing and transmitting the data it captures. Using the Factom blockchain, data retrieved from security cameras and other sensors are encrypted and stored, using blockchain as a means of mitigating the risk of data breaches. The project is still ongoing. As one of the world’s most technologically advanced countries, it’s no surprise China has become one of the first and most prominent adopters of blockchain and everything it offers. It has decided to use the technology to facilitate taxation and electronic invoice issuance in a project headed by Miaocai Network in conjunction with the State Administration of Taxation. Blockchain once again proves that it’s not just applicable in the crypto space and by small companies. The government of Georgia uses it to register land titles. They have created a custom-designed blockchain system and integrated it into the digital records system of the National Agency of Public Registry (NAPR). Georgia is now taking advantage of the transparency and fraud reduction offered by blockchain technology. Amazon Web Services have collaborated with Digital Currency Group (DCG) to improve their database security with the help of blockchain. They will provide a platform for DCG’s startups to work, as well as technical support for their projects. A man is a wolf to another man, and an even bigger wolf to animals. ‘Care for the Uncared’ is an NGO that is working with leading developers to find a way to preserve and protect endangered species using blockchain technologies. Permanence is now a hot topic in the journalism trade. One wrong move and years of hard work and research could go down the drain. Blockchain is one smart solution to the problem. Civil, a decentralized journalism marketplace, apart from obvious blockchain benefits, offers an economic incentive model for quality news content, coupled with the ability to permanently archive content, which will remain accessible at any time in perpetuity. Smart cities are not the stuff of science-fiction anymore. Taipei is attempting to position itself as a city of the future with the help of Distributed Ledger Technology. It has announced a partnership with IOTA and they are already working on creating cards with light, temperature, humidity and pollution detection. One of the leading players in the commodity market, S&P Global Platts, is trialling a blockchain solution that’s being used to record oil storage data. Weekly inventories will be stored on the blockchain, reducing the need for manual data management and minimizing the chance of human error. In Russia, rail operator Novotrans is using blockchain technology with a goal to improve the speed of its operations. The company, which is one of the largest rolling stock operators in the country, will be using blockchain to record data pertaining to repair requests, inventory and other matters pertaining to their operations. The idea is that blockchain records will be more resistant to tampering and data corruption..
Blockchain’s distributed ledger technology is ideally suited to registering records of any kind in a secure and unalterable manner. One such use case being developed by Essentia is the vehicle rental industry. Major rental companies will be able to utilize Essentia’s blockchain protocol to store customer data, fully encrypted and shareable on a permissioned basis with relevant parties. Every day, the number of blockchains used in real world scenarios grows. From logistics to fine art, it’s hard to find a sector that hasn’t been touched by this transformative technology. We have reached a point where the technology has proven itself to be superior than the current modus operandi. 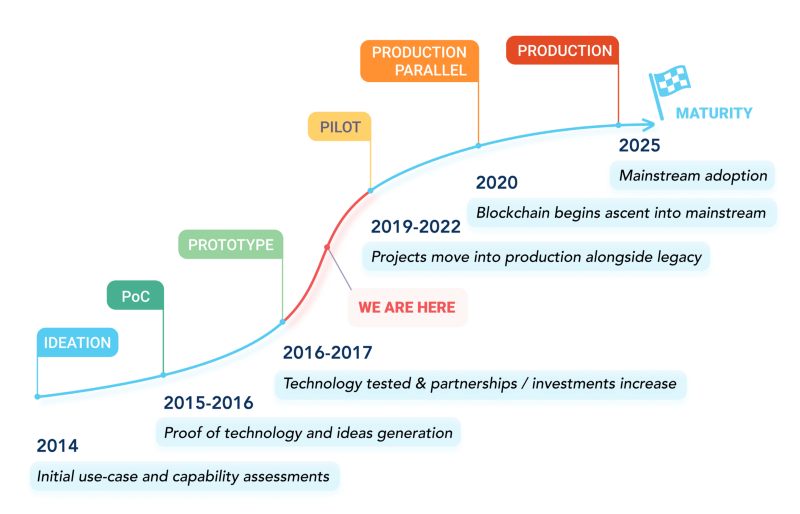 The ‘WEF’ predicts that by 2025 the world will see mainstream blockchain adoption. But after examining the use cases already in the implementation stages we have to ask, we have to ask, will it really take that long? There’s only one small kink in the chain holding everything back. That kink is known as interoperability. Think of a river that has peacefully flowed along for the past 15 years, then all of a sudden a storm appears and it rains for weeks on end, turning the river into a raging torrent, sweeping away everything in its path. That river is the Web 2.0 and the storm of blockchains have already changed the internet landscape. So what remains? When the rain stops and the floods subside, with the old foliage swept away, a vast swathe of fertile land awaits to be farmed. The river, which facilitated the flow and interoperation within the natural ecosystem is gone. And the same goes for the Web 3.0, we can see growth in various sectors but they are still largely incompatible with each other. But ‘hey presto’ there’s already a solution in the works for that. It’s called Essentia, and it’s like a farmers tool for building new decentralized ecosystems on this fertile land. It’s job is to create connections and facilitate interoperations to create a cohesive blockchain environment. This could mean health-care blockchains are compatible with insurance chains, or international rail working with with cross-border customs chains. 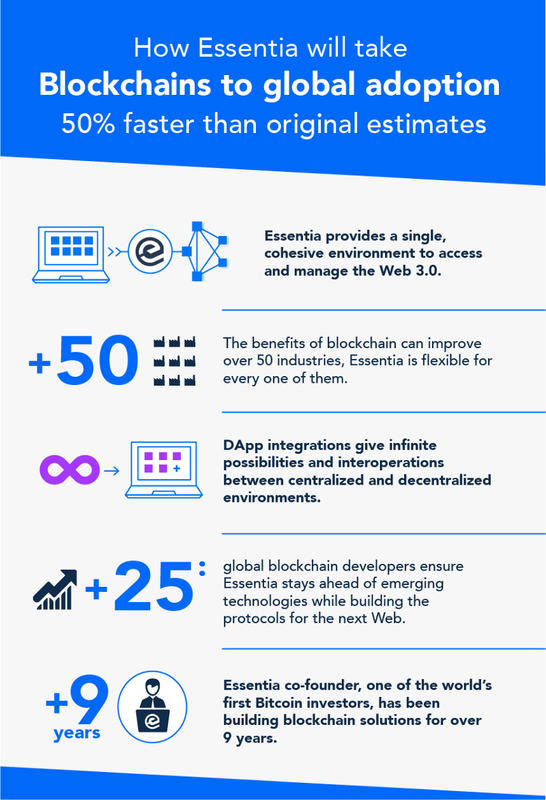 Essentia is the vehicle that the digital world needs in order speed up the blockchain adoption process. Some suggest that we could see it happen 50% sooner than originally estimated, that means by around the year 2020 the internet ecosystem could go regain its interoperability, while decentralized blockchains fill in the void of privacy, security and data ownership.